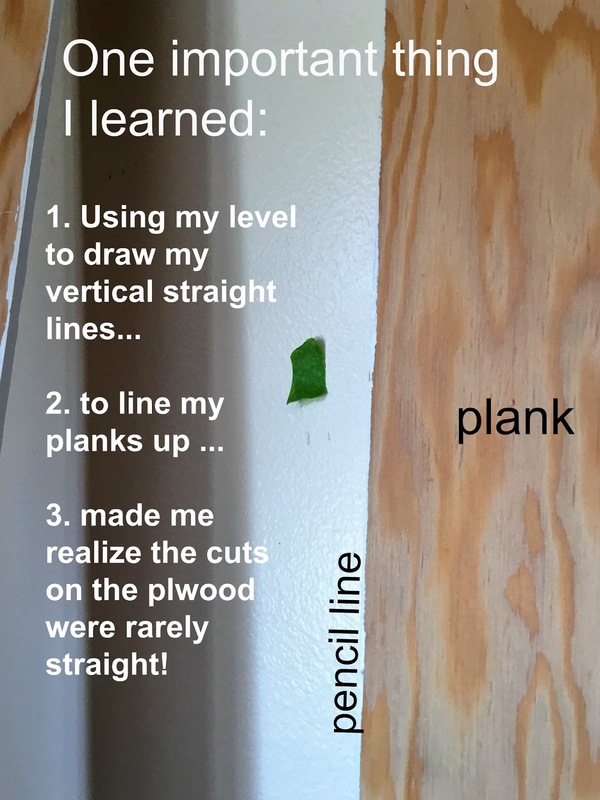 Gwen Moss: Installing Vertical Planks: ONE important thing i learned! Installing Vertical Planks: ONE important thing i learned! Well I'm finally putting together a post to tell you about our bedroom-turned-family room with the vertical planked walls that I installed. And yes, I'm sharing the one important thing I learned from my experience. But I have a little confession to make. "Lady! Why didn't ya just use sheets of beadboard?!" That my friends, is the question I asked myself more than once when I was working with the 6-inch-wide strips of plywood that the Home Depot guys had ripped for me on their saw. Although to be honest I always have one of those what-did-I-get myself-into-moments when I'm working without my Dad. And even though I eventually finished this room, believe me, there was a lot exasperation about getting my vertical lines straight. When my Dad visits next month, I know he'll be smiling and really supportive of my job, but he'll definitely see my little mistakes. Here's the one mistake that bugs me the most although chances are, you might not notice it. I had to point it out to Jim. 1. Horiozontal vs Vertical Planks? OK, so back to the topic of vertical planks. I don't see as many vertical plank projects, do you? At least compared to the shiplap ala-Joanna-Gaines-Fixer-Upper look that's so popular these days. If you're still on the fence about shiplap here's an interesting article on whether it fits with your home. And I find the look quite charming, especially for our home which is near the ocean. Still, I'm not sure I would've deviated from the horizontal planks which I've already installed in certain parts of my home, --if it wasn't for our low ceilings in this one bedroom. A dark room ....with little natural light and low (less that 8 ft) ceilings that made it feel claustrophobic. The previous owners lowered the ceilings in this room to accommodate the can lighting, and according to our electrician, it's not uncommon around here. But since changing the ceiling height is entirely dependent on winning the lottery which I never play--installing vertical planks were my answer to adding to the illusion of height in this bedroom. The next stage was transforming this bedroom into a casual living space for everyone. 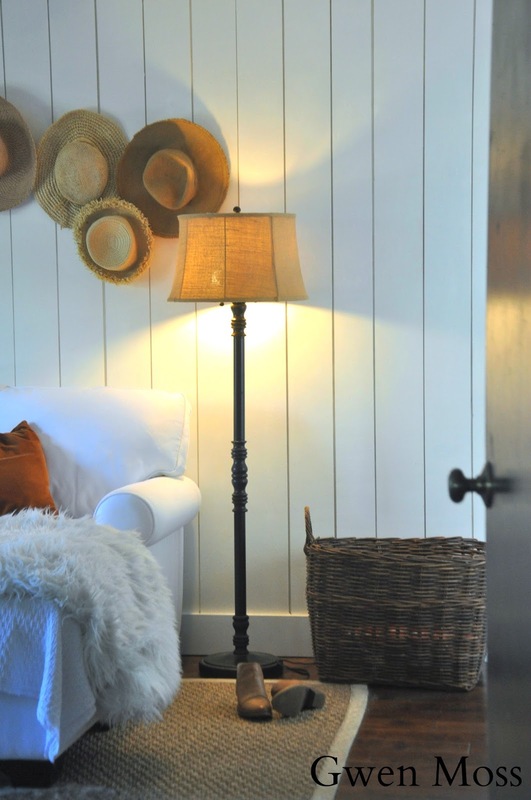 beadboard sheets or individual planks? For me the answer was easy. Because I was working alone I ruled out sheets of beadboard because of the sheer hassle of lifting and moving them myself, and no I didn't want to wait for weekends when the hubby could help me. I know that might seem like a weak reason to rule out beadboard but that's how I roll. 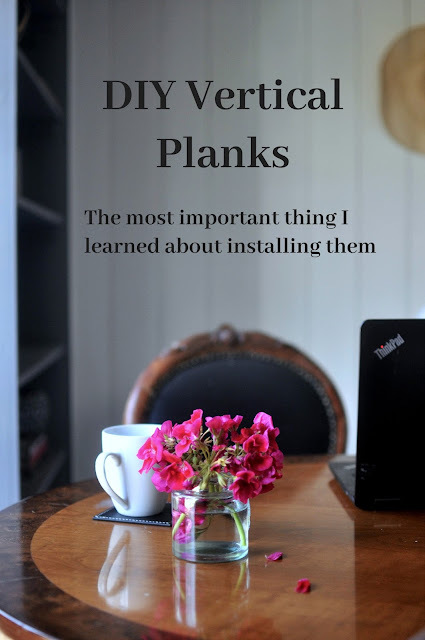 Also there were two other factors on why I went with faux planks: first I prefer a wider plank beadboard which our lumber yard didn't carry and second, I didn't want to pay for the pricier tongue and groove planks. Since I already knew our local Home Depot would rip my plywood sheets for me I went that way. thought the "faux' vertical planks would be similar to the horizontal planks. 4. To cut or not to cut my own sheets of plywood? When using the 'faux' planks ripped from plywood sheets most of us choose to have our local Home Depot or Lowe's do it. Even though I've got a table saw, the thought of ripping all my own wood felt too time consuming. Although in hindsight, the time I saved cutting my planks, I probably wasted in added installation work. After measuring the room I collected my planks over a week, by dropping into two different Home Depot stores and asking whoever happened to be at their saw. One of my helpers was the manager who was absolutely fastidious about his cuts. Those were the straight ones. The rest of the cuts were pretty irregular which wouldn't have been that noticable if I were laying them horizontally. But once I got started it was obvious that I would have to make a choice. or I could use the spacers to guarantee uniform space between the planks, however the vertical lines would not be straight. I chose to keep the vertical lines all straight. To further add to my novice carpenter woes, one of the Home Depot guys had pulled out a plywood sheet that was thicker than my others and I didn't catch it. And yep, it got mixed in with the planks on the wall. OK. So this is how I know I'm not truly a perfectionist, because if my Dad had noticed the slight difference between the planks on the wall he would've walked over to the flawed plank and yanked it off. Just like that, because it was the wrong size plain and simple. That of course, would've led to a few more planks being pulled off because of the newly open space that would have to be re-measured for the new plank to look an equal distance from the others. Are you seeing how one thing leads to another when it comes to measuring? So this is what I did. I sat and stared at the thick plank with my mouth open, took a deep sigh, had a sip from my water bottle, cringed a little more and kept going. At that point the mere thought of going back to a crowded and under-staffed Home Depot and bringing back more wood made me want to jump head-first into shark-infested waters. (which is basically how I view swimming in the ocean). This photo shows how each plank needed to be cut down to the size of the wall. Then new trim and new baseboards followed. And so I'm left with what I jokingly call my rustic walls, in the style of a quaint cottage from the rural countryside. What's wrong with a few odd planks here and there right? Just add some white paint and voila! I brought the rug from the dining room in here to warm up all the white. I plan on sharing some photos of the REVEAL for this room shortly. Since we splurged on a new sectional in here, everything else in this room is either re-purposed from our old home or bought at a consignment or thrift store. Which makes decorating a fun challenge. I am in awe - you did that your self! Of course you did, because, like me, once you get an idea you want to run with it. I saw our handyman yesterday, the stitches are out of his finger (that he nearly cut off) and I asked him if he was ready to start my plate racks. He said he can make them next week! Carol I can't wait to see the new plate rack, so glad your poor neighbor is fine too. That sounds like quite a painful injury. Leslie- it looks perfectly imperfect, which is the look I prefer. I commend your determination. I cannot wait to see the whole reveal. Well, it looks like you did a great job. We installed real beadboard (2" strip by 2" strip) throughout quite a bit of our waterfront house. I wish we had just gone with the sheets of it, too, as it expands and retracts during weather changes and you can see the individual 'seams' during the winter months. Your room looks wonderful and any mistakes are visible only to you! Great work! Love your ambition and dream come true. Isn't it a wonder how we can accomplish our hearts desire not letting little setbacks (wrong size plywood) slow one down. Currently, I am pursuing changing a 10x20 outdoor shed into a SHE SHED. The first big task is to find a place to store or get rid of all the stuff that is in there. My husband is all for it but wonder if he will be available to help (hee hee). I am so possessed thinking about how to decorate the space and all that must be accomplished. Bit by bit it will happen and you inspire me. Love the french doors! Bobby you're awesome! I love your 'can-do' attitude and I can't wait to hear more about this She-shed of yours. I can relate about having a lot of extra stuff that needs a better place--some flat out needs to go--and we've been working on that slowly. But there's SO much you can do with a 10x20 shed, that's huge! ! Keep in touch with me and let me know how it goes...and thanks for your supportive words, but honestly you're inspiring me! We DIY-installed sheets of beadboard when we renovated our old house guest bath, but the walls were concrete and not flat; they had a few "lumpy" places so you know the panels kept separating at the seams. Grrrr! It's amazing what you can accomplish with Liquid Nails, a nail gun, and lots of will power! But now... I've decided to address "perfectly imperfect" in our "soon" farmhouse. All walls will be wide heart pine planks salvaged from an 1889 schoolhouse here in our valley — once we remove all of the nails and plane them to 7/8". Still deciding if I'll do both horizontal and vertical installations or only horizontal; guess we'll see when the time comes... Thankfully this time, once we finish the prep work, we can leave the installation to the professionals. Leslie, I'm in awe of your ability to do all of this yourself. Not only are you a gifted writer, yogi, and advisor, you are an accomplished remodeler. Kudos to you! The wall looks fabulous! I am totally gobsmacked by this project. I recently had beadboard installed in my first floor. I had 8" boards milled—I wanted poplar, not pine—and I was told it would be better to face nail the boards. I did not install, but I watched my very talented carpenter deal with my out of square house with imperfect drywall. He used 1 x 6 furring strips adding to the complexity. The corners were always covered with swear words! That you did this job by yourself, totally astounds me. Great job. Enjoy your view! Wow, Leslie!! What a fabulous project! It looks great! 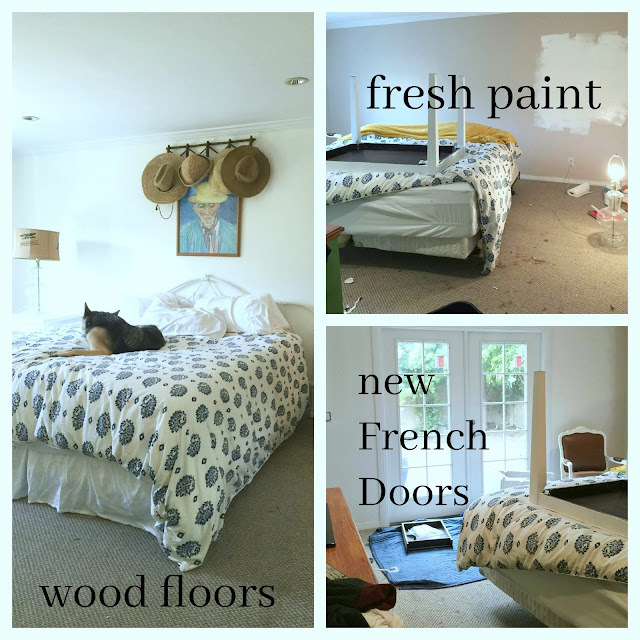 Just sent you link to my Sister who is looking to redo another room. Have a great week. Oh Sarah, thank you so much!! My goodness I certainly don't feel like the person you're talking about but your words made my entire day. What a sweet friend you are. I love how the wall turned out, Leslie! And the perfectly imperfect planks have a wonderful handcrafted look! Great job! 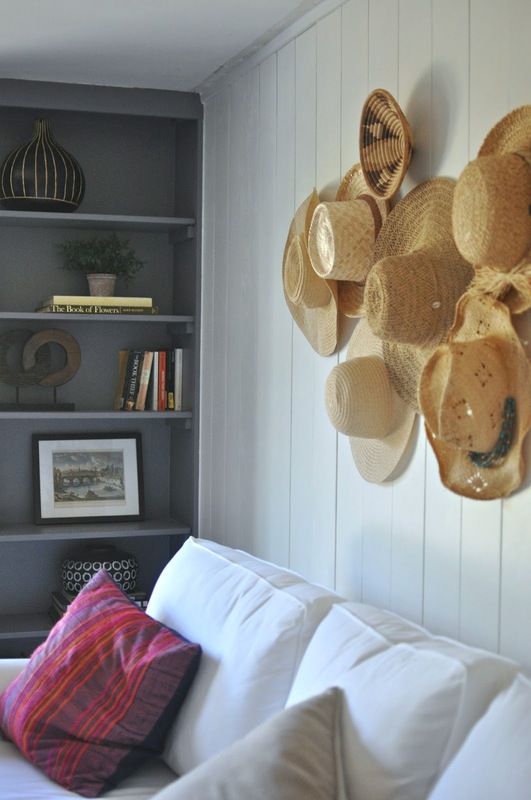 Your room is totally transformed with the planking and bookshelf! Bravo to you for doing it all by yourself! After installing our t & g backsplash, I know what a big undertaking it must have been to plank an entire room. I love the beach vibe you've got going! THAT is the BEST way to DECORATE!!!!! IT ALL LOOKS GRAND........YOUR PAPA IS BEAMING after reading this!!!!!!!! I'm PROUD of YOU and I do not even KNOW YOU!!! I love what you did!! And by your self!! My question is how did you ,or did you if the boards that were not cut straight?? I have been wanting do this to our bedroom wall and thought I would use reclaimed wood. But now I am having second thoughts. I really like what you did! So I think I will follow what you did but go horizontal. We have 10' ceilings and love the ship lap look,too. You are positively amazing. I would never attempt a project like this #1 because I could never do it to please my husband and #2 I would mess it up for sure!! You need your own HGTV show! Nice job! What an undertaking. Love the look! My dad taught me to DIY...he grew up in construction during a time when the builder worked start to finish...poured the footings and installed the door knobs and everything in between. He too was a perfectionist...but he had a favorite saying that has saved my sanity on more than one occasion..."You'll never notice it on a passing train."